Nationalists marched in Kaunas, a city east of Lithuania’s capitol of Vilnius, to celebrate alleged Nazi collaborators. Members of defendinghistory.com – a website dedicated to exposing extremism in Lithuania monitored the 16 February march. 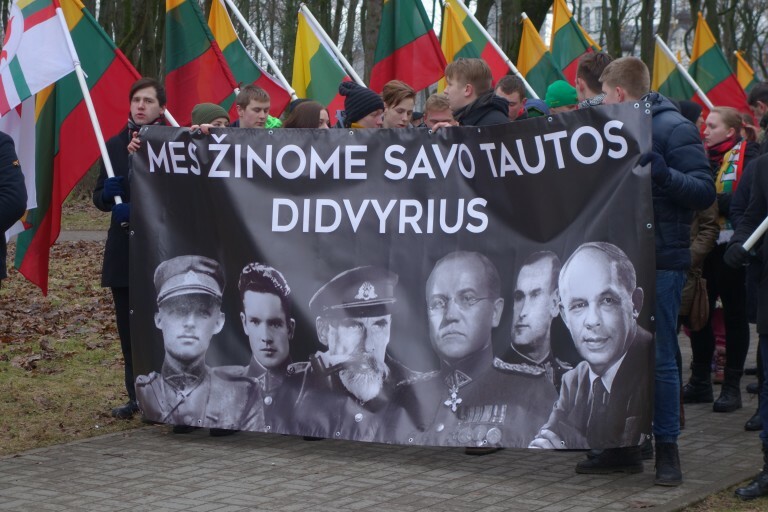 The Union of Nationalist Youth of Lithuania organised the march to fall on the anniversary of Lithuania’s declaration of independence in 1918. Under the banner “We Know Our Nation’s Heroes”were pictures of Adolfas Ramanauskas-Vanagas, Jonas Noreika, Povilas Plechavičius, Kazys Škirpa, Antanas Baltūsis-Žvejas, and Juozas Ambrazevičius-Brazaitis. Individuals accused of direct complicity in the Holocaust or fighting alongside Nazi forces. The Soviet Union invaded Lithuania in 1940. And within two months had annexed the country. A year later and Lithuania had absorbed Jewish refugees fleeing Nazi tyranny in Poland. This swelled Lithuania’s Jewish population to 250,000 (10 per cent of the population). Juozas Ambrazevičius-Brazaitis formed a provisional government after Nazi Germany had expelled the Soviets. Nazi Germany had banned the preferred choice of Kazys Skirpa from returning to Lithuania. It lasted for six weeks. Some accuse it of it complicity with the invading Nazi forces. Others would argue that it attempted in vein to restore statehood. The provisional government had welcomed the Nazi vision for a ‘new Europe’. And its staunch anti-Bolshevism. Journalist Vidmantas Valiušaitis, however, sought to draw a line between the actions of the provisional government and that of the Lithuanian Activist Front. The antisemitic elements of the latter had denounced Lithuanian Jews as ‘traitors’. And might have been behind the paroxysms of antisemitic violence that began before the arrival of Nazi Germany. The efficiency of Nazi genocide in Lithuania owes in part to complicity. Lithuanian auxiliaries worked with Einsatzgruppen units to eradicate most Jews in rural Lithuania in August 1941. More than 30,000 of Vilna’s Jews died in Ponar, a wooded area outside the city. By November of that year, the Nazis had murdered most of the Jews in ghettos of the larger cities. Of the remaining 40,000 or so Jews resided in ghettos. Overcrowding, food shortages, and outbreaks of disease were products of inhumane living conditions. In response to mass murderer, resistance movements grew across the existing ghettos. In Vilna, Abba Kovner (1918-1988) urged Jews to rise up and fight at a meeting of Zionist youth groups on 1 January 1942. Kovner argued with passion that “the only reply to the murderer is revolt!” Within weeks of this speech, Zionist youth leaders and Communists formed the Fareynegte Partizaner Organizatsye (United Partisan Organization; FPO). The FPO had a number of aims: to inspire Jews outside of Vilna to use armed resistance, carry out sabotage and unite resistance groups. Their successes included destroying a German military train and smuggling weapons into the ghetto. They also managed to send emissaries into the Warsaw and Bialystok ghettos to warn them of the genocide. In 1943, the Nazis cracked down on FPO activities. German police officials threatened to liquidate the Vilna ghetto and its 20,000 inhabitants if they failed to hand over FPO leader Yitzhak Wittenberg. Armed groups within the ghetto had freed Wittenberg from custody but he later turned himself in in light of the group’s decision. He would then take his own life in German custody. The liquidation of smaller ghettos in other parts of Lithuania took a matter of days to complete. In Švenčionys, in northeastern Lithuania, it took the Nazis and ‘patriot’ collaborators just two days to murder 8,000 Jews. Nazi collaborators saved ammo by smashing the heads of children into trees. Some say the violence had left its own scars upon the trees. A survivor of this liquidation, Zhenja Gurevich, recalled boarding a train to Kovno. When it arrived at the killing fields of Ponar, many Jews fled into the forests. Gurevich did not escape capture and soon found herself in the Vilna ghetto. Following the Warsaw ghetto uprising of 1943, the Nazis became more aware of armed resistance in the ghettos. In response, the authority over Lithuania’s ghettos switched to the SS. On 21 June 1943, SS Chief Heinrich Himmler had ordered the liquidation of all ghettos in the Reichskommissariat Ostland. The Ostland was a German civil administration that covered the Baltic states and western Belorussia. Nazi forces began deporting Jews from the Vilna ghetto to Estonia. Estonian security forces assisted in the arrests and deportations. The FPO gathered around 100 armed members to resist. Some had escaped and reentered the ghetto hoping to inspire a mass revolt that did not arrive. As the spectre of liquidation drew near, their leader Abba Kovner and others escaped. They later joined Soviet partisan missions to liberate Vilna in 1944. If the complicity of others underpinned genocide, what of Ambrazevičius-Brazaitis? He did sign an order to build a concentration camp and establish a ghetto in Kaunas. Others maintain he was a staunch anti-Nazi upon leaving the provisional government. According to BNS, four members of that provisional government ended up in concentration camps. In 2012, the deep trauma of the Holocaust re-entered the Lithuanian political debate. The then government had set aside 30,000 litas ($11,000) for the burial and repatriation of Brazaitis. Former Prime Minister Andrius Kubilius had defended this move in spite of understandable outrage from Jewish voices. Kubilius cited a 1975 investigation from US Immigration that absolved Brazaitis of pro-Nazi complicity. A number of liberal intellectuals had condemned Kubilius’s plan. Up to 95 per cent of Lithuania’s Jews died as a result of the Holocaust. Their Jewish culture, including its own unique dialect of the Yiddish language, was almost lost to the winds of history. Crushed by the racist, antisemitic totalitarianism of Nazi Germany and its complicit allies.